Heroes, Heroines, and History: Panning for Gold! And a Giveaway! 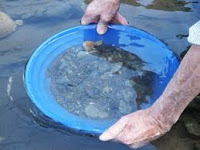 Panning for Gold! And a Giveaway! Last month, I wrote about the beginning of the Georgia gold rush of 1830 with the promise of teaching you how to become a prospector just like Abby, the heroine in my latest manuscript. 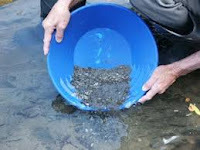 Being a hands on researcher, I knew panning for gold was going to be a wet, dirty job but I never counted on needed a bottle of Motrin! First, you’ll need a pan. There are specialty pans made just for gold mining that have ridges along the outer edges to collect small amounts of gold dust. But you can use an old pie pan for this experiment, like the ones at the grocery store with the graham cracker crust. Any pan with a graduated lip will do though. The best place to pan for gold is in a stream, creek or (if you’re lucky!) a river bank, preferably in the foothills or valleys far from the mountains where a large vein of gold may be embedded. Look for a bend in the river or creek, or a place where the current is not very strong. Gold is very heavy and is not easily pushed with the current in these areas. lot of water during this stage--it helps carry off the lighter dirt and sticks without carrying off the gold. And be prepared--the weight of the dirt, gravel and water is extremely heavy and puts quite a strain on your upper arms and back! Now for the hard part! Cup one hand around the front of your pan so that you can tip the water out without losing your gold. You’ll need to continue doing this until you have a layer of thick muck along the bottom of your pan. This is the concentrate you’ll work until you’ve washed all the fine sand away, leaving a dark black sand or magnetite, a heavy mineral compose of iron. The presence of this is a good sign because both this iron oxide and gold are heavy, and are generally found along side each other. As you continue, you'll start to see flakes gathered along the bottom rim of your pan. Congratulations! You've struck gold! I haven't given a book away in a while so if you leave a comment--maybe a memory of a time you might have mined for gold/gems--you'll be entered into a drawing to win an advance copy of my November release, The Doctor's Bride. Because of the cost of international shipping, continental US only. I have never had the opportunity to pan for gold or gems but I'd love to be entered in the contest to possibly win! I've never panned for gold but I'd like to try! kkakins (at) gmail (dot) com. Joanna, maybe there isn't any gold near you but mining for gems is just as fun. In fact, it's not unusual to find my husband working a small pan when we visit Pigeon Forge. He loves looking through the rocks! I don't know about easy! It takes about fifteen to twenty minutes to work a pan of dirt, and by the time I was finished, I thought my arms were going to fall off! But it was fun and I did end up with a small vial of gold dust. My husband loves the idea of panning for gold and we watch the tv show Gold Rush Alaska. Before the show ever came out I got him his gold mining membership and he got his pan and we went to a river in Iowa and he panned but unfortunately never got anything but he had fun doing it. We had the pleasure of unexpectedly meeting Dakota Fred. We were at an air show and he walked by us and I went up to him and said hi, he was one of the nicest people and insisted on having a picture with us. Thank you for the chance to win this book. My husband and I use to watch Gold Rush Alaska, but we got frustrated with the main group because, honestly, they didn't have a plug nickel worth of sense between them. But Dakota Fred knew what he was doing--and I felt so bad for him when he lost his house in a flood. I've never panned for gold, or ever really thought about it! We do have some gem mining places nearby, but haven't tried that either. My sister and parents have tried it. Seems to much like work to me! My family and I went to a mining place fir tourists in Tenn several years ago. You would dig a bucket full of dirt and bring it back to the mining area. We then sifted out the dirt. As a family we found eight or more decent sized rubies. We had them polished for jewelry, but never put them in anything. I still have them somewhere. We've done that, Ginger. If you go down to the Little Pigeon River, you can find all sorts of gems, especially rubies and emeralds! I don't think I ever panned for gold - missed my chance when I lived in Wyoming! - but I did see some old-timers in the ghost town of Atlantic City, WY panning for gold. Apparently, they made enough to support themselves, because that's all they did! Being a southern girl, I remember thinking that Grand Rapids was flatter than a pancake! We could see for MILES from our back porch! And I was surprised by how many miners that are still making a living up in the Georgia mountains-they don't make much but then they live simpler than most. 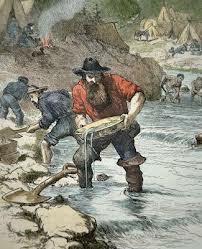 I remember panning for gold once when I was a kid my family visited Cripple Creek, CO. It was fun then, but if I had to do it a long time, I would think it would get boring. Then again, if you found gold now and then, that would be a great incentive to keep going. Boring and PAINFUL! My arms hurt for a couple of days afterward. Guess that tells you how much the gold rush fever infected some folks! Enjoyed your blog post - have never mined for gold/gems, but would love to win a copy of your book! I've never mined for gold, but I would like to try. I enjoyed your post. I've never read any articles on how to pan or mine for gold. Very interesting. Thank you for sharing and please enter me in the giveaway. Patty, I vaguely remember doing something like this in Colorado when I was a kid. I'd love to try it again for the experience. I used to go to Wyoming with my ex-boyfriend and his family where we'd camp out at his grandparent's cabin in the mountains. We panned for gold there a few times but I actually found any. It was fun, but I think we all enjoyed the water fights more than anything else! Thanks for the chance to win your book! I want to thank everyone who dropped by today! And now for the giveaway--DRUM ROLL PLEASE! The winner is JoJo! Congratulations, Jo Jo! I'll be getting in touch with you shortly! I have never panned for gold but my son-in-law watches shows on this kind of stuff and would love to do it. Patty, the Piedra River behind our East Ranch is perfect for panning. We have several spots that are begging for an afternoon of looking for gold. I've got my equipment all ready. Thanks for the jump-start with your post. We have sluiced gems a couple of times. It was a lot of fun. We bought a bucket with sand and gems in it. We did not know what we had until they poured a little at a time into the pan and washed it in the sluice. The boys enjoyed it and came away with a lot of neat looking "gems" that we took home and kept.